Many of us struggle with time. Even though we think we are good time managers we often feel that there is more to be squeezed from each hour of the day. Creating a purposeful life is not another book about organizing your email. Indeed it isn’t a time ‘management’ book at all. Instead it will help you build a better relationship with time. 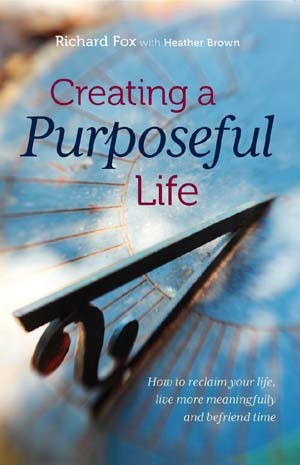 It is a practical guide that’s full of tips on how to unearth your unique purpose in life and enjoy a more sustainable relationship with time. If you feel that sometimes the meaning and purpose of your life aren’t clear to you and that time is flying by; or if you feel unfulfilled in life and are considering a change of career; or you’ve read all the time management books and still feel that time flies by and you want some practical tips that are easy to implement and which will have long-lasting effects, then Creating a purposeful life is for you. The book will help you examine your current relationship with time, develop your own purposeful life action plan, overcome barriers to change, use your time more intentionally, plan your career and choose some ideas to sustain you on your journey. Based on Richard Fox’s intensive international research into our relationship with time, it is thought-provoking and practical at the same time, presented in small packages which can be digested individually or put together into a larger action plan.